That doctor’s words stayed with me for many years, because they underscored the contradiction between our idealized view of “home” and the harsh realities of life that push talented people to leave their homes. The doctor was a classic case of the “brain drain” phenomenon that has afflicted developing countries for decades. These countries spend scarce resources educating doctors, engineers and scientists, in the hope that they will become engines of prosperity. Then we watch with dismay as they migrate to the West, taking with them the promise of their talent. It is, of course, everyone’s right to choose a better life, wherever in the world they wish. We understand why they go. Talent is drawn – like a magnet – to opportunity. For the countries left behind, however, it feels like an endless vicious cycle: they need talent to create opportunity; but without opportunity, talent gravitates to the bright lights of the West. Indeed, the United Nations and the OECD report that migration for work has risen by one-third since 2000. One in nine university graduates from Africa now lives and works in the West. Many will not return: skilled workers are six times more likely to stay away. But now something remarkable is happening. In some countries, the brain drain has reversed its flow. The causes are fascinating, and there is reason to be optimistic that the vicious cycle can be broken, transforming the balance of hope and opportunity between developing and developed economies. A new study by LinkedIn, the world’s largest online professional network and recruitment platform, has measured the net international movement of talent among its members. Topping the list as a destination for talent is my own country, the United Arab Emirates, with a net talent gain of 1.3% of the workforce in 2013. 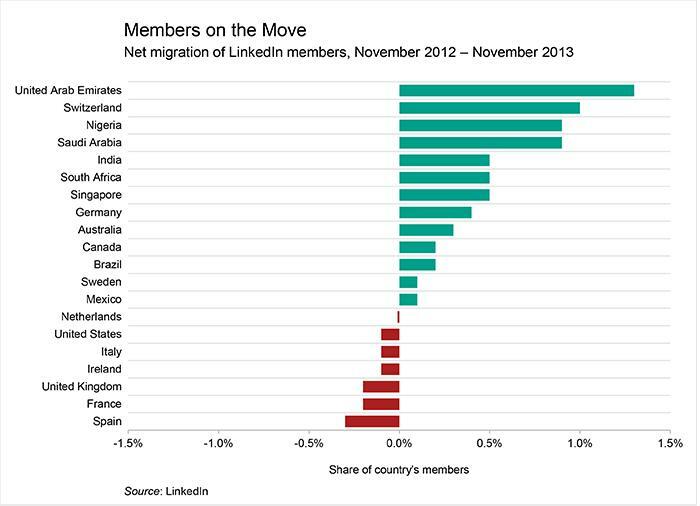 Other net “talent magnets” include Saudi Arabia, Nigeria, South Africa, India, and Brazil. Most interesting, fewer than one-third of net talent importers are developed countries. In fact, the top talent exporters in this study are Spain, the UK, France, the United States, Italy, and Ireland. Rich countries that until recently had been tempting away our brightest minds are now sending us their own. Of course, this is only one study, and many poor countries still suffer from a chronic talent exodus. OECD data show that many countries in Africa and Latin America have migration rates for graduates above 50%. We do know that brain drain is often a function of safety and security as much as economic opportunity. Part of the tragedy playing out in Middle Eastern countries beset by conflict and instability is that if only their most talented sons and daughters could apply their skills at home, they would become part of the solution: agents of peace through development. This makes it all the more important to examine how some developing countries succeeded in reversing the outward flow. The basic ingredient is opportunity. Talent flows naturally to countries that create an environment for economic growth; that make life easy for enterprise; that attract and welcome investment; and that nurture a culture of achievement. Skills are attracted to challenge and possibility. Opportunity on this scale is becoming a scarce commodity in many parts of the West. But this is not the case in the developing world – at least among countries with the appetite and determination to deploy strong governance and continually raise their competitiveness. Second, quality of life matters greatly. A generation ago, many talented individuals would consider working outside the West a “hardship posting.” Today, standards of living in the UAE, for example, are among the highest in the world. We have shown that the business of reversing brain drain is also the business of creating a better life for citizens and residents. Building happiness is, after all, the primary business of good government everywhere. Ours is a story of great hope for the Middle East in particular, where generations of conflict and despair have driven high levels of outward migration. I have always argued that, besides good governance, the best solutions to the divisions and strife of the Arab world lie in grassroots development and economic opportunity. Now, we have shown that it is possible to reverse the forces that had driven away our most talented young people. Another source of hope is that this turnaround can happen remarkably quickly. Research shows that small countries suffer disproportionately from brain drain. But we have shown that even for a small country like the UAE, and even in a region divided by conflict, it is worth building an island of opportunity. But let me be clear: reversing brain drain is about more than plugging a leak. It means turning a vicious cycle into a virtuous one. By attracting the best talent from around the world, we can create a vibrant and diverse society that fuels innovation and prosperity – which in turn attracts still more talent. To make this work, we must believe in people. Human beings – their ideas, innovations, dreams, and connections – are the capital of the future. In this sense, the “brain regain” is not so much an achievement in itself as it is a leading indicator of development, because where great minds go today, great things will happen tomorrow. Author: His Highness Sheikh Mohammed Bin Rashid Al Maktoum is the Vice President of the United Arab Emirates (UAE), and constitutional monarch of Dubai.